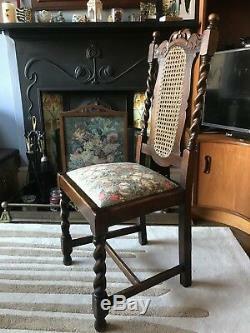 An exceptional oak Jacobean Revival or Jacobethan chair. 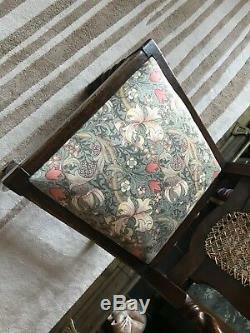 Barley twist, reupholstered in a fine William Morris linen fabric. 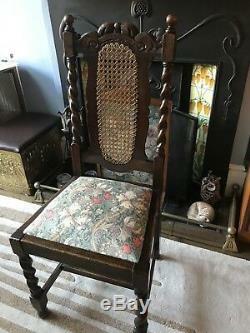 Sometimes referred to as Flemish and Dutch Carved these chairs were popular during the 19th Century and as a Style and Design it remained popular into the other Edwardian years. Indeed, similar chairs figure hugely in posed family photographs of the 1890s. I have professionally reupholstered the drop in seat using traditional techniques and recaned the back panel. The wood has been French polished to protect it for the next 100 years. Floor to top of back 104cm. Seat width at front 46cm. Width of back rest 38cm. Traditional hole-to-hole chair caning is a well-known seatweaving technique, woven by hand one strand at a time, laced through a series of drilled holes in the frame, using a material called cane. This cane weaving material comes from the rattan palm and is imported from places like Malaysia, Asia, China, Africa and the Philippines. Chair cane is the skin or the bark of the rattan palm which is under a thorny surface. Cane has a natural glossy side that is the right-side-up or visible side, with a very porous wrong side. There are holes drilled through the frame of the chair on the outer perimeter that the strands of cane are woven or laced through. By the way, these drilled holes are the holes you will count when asking an expert to repair your chair seat. Generally speaking, the cost of repair is based on the amount of the holes times amount the expert charges. Traditional hole-to-hole or strand hand caning is woven with a variety of gauges of cane, all determined by the size of the holes drilled into the chair frame and the distance between holes. The traditional hand caning weave used is a very distinctive and common series of octagon holes in the pattern when completed. And although there are a number of various cane patterns and designs, this seven-step method has proved to be the most durable and longest-lasting of the various hole or lace caning patterns over several centuries. An average lifespan of this chair seat pattern is 25 years, with good care and maintenance. Check out my Facebook page retroandteak mid Century Furniture and if you like my furniture, like my page. 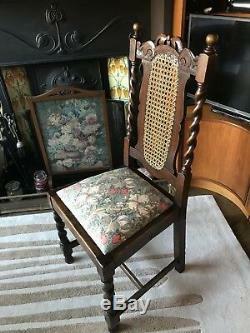 Here you will see before and after photos showing the work that has been done to this chair. Perfect for the vintage, or contemporary home and an ideal addition to any interior. In excellent vintage condition with minimal age-related wear, but nothing unsightly. It is solid and sturdy and have been cleaned and polished ready for use. Only 5 minutes walk from Tube. It will easily fit in a car but you can arrange your own courier. The item "Arts And Crafts Victorian Jacobean Revival Style Gothic William Morris Chair" is in sale since Monday, February 19, 2018. This item is in the category "Home, Furniture & DIY\Furniture\Chairs". The seller is "retroandteak" and is located in Bounds Green, London. This item can be shipped to United Kingdom.